Electric vans don’t have to be expensive to deploy. Fleets can take advantage of the UK Government’s Plug-in Van Grant, which offers 20% (up to a maximum of £8,000) off the list price, while vehicle excise duty (VED) is zero. With demand increasing for used vehicles, residual values are improving too. Electricity costs for the Kangoo Z.E. 33 are around 4p per mile‡, which is around half the equivalent cost† of the efficient diesel version. Over a three-year, 60,000-mile lifespan, going electric could save over £2,400 in fuel alone and, because they can be charged at a depot while they are parked or being loaded, there’s no need to waste time making dedicated refuelling trips either. Maintaining an electric van is actually easier than its diesel equivalent. There are fewer items to change during a scheduled service and, because of regenerative braking through the motor, brakes may need to be replaced less frequently. Customers are supported by Renault’s nationwide network of specialist workshops, trained to work with the technology. Based on a typical three-year, 60,000-mile lifespan, and including an estimated £2,400‡ in electricity costs, the Kangoo Z.E. 33 offers a £2,837.52 saving versus an equivalent diesel version. And fleets based in London could save even more. The Kangoo Z.E. 33 is exempt from the £11.50 daily London Congestion Charge, reducing running costs by an additional £2,530 (five-day working week, 44 weeks per year) over the vehicle lifecycle, making total savings around £5,368. 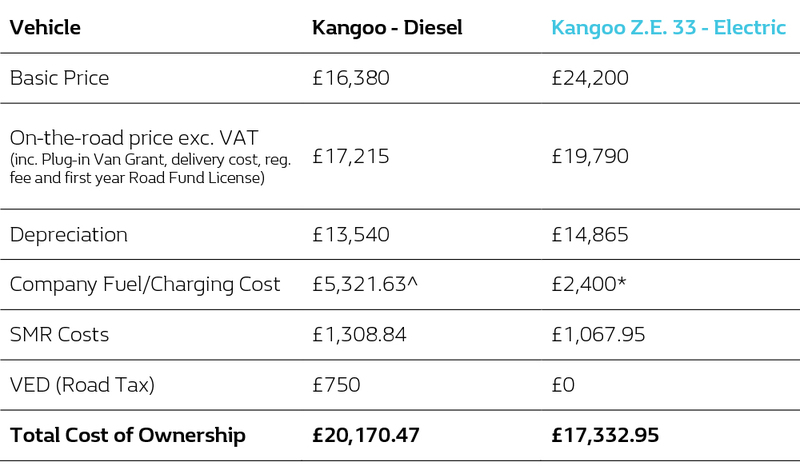 Versions compared: Kangoo ML20 ENERGY dCi 90 Business Van [Euro 6] to Kangoo Z.E. ML20 33kWh Business i-Van Auto. * Recharge cost calculated by (a) electricity charges (e.on Go Online 1 Year v18 rates for payment via monthly Direct Debit as of Sept 2018) and (b) a full recharge of the 33kWh battery.